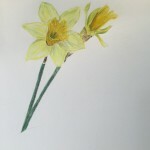 This week I made a start on flowers and plants by doing a couple of drawings of daffodils. 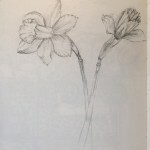 To be honest, I quite like the pencil drawing of the open daffodil and that came together quite easily but the one in partial bud was tricky to get right and I ended up rubbing it out a few times till the paper got too grubby and I gave it up as a bad job. Shame, but you can’t get it right all the time, I suppose. So, having been working in black and white for weeks, I just fancied a bit of colour so pulled out the water colour pencils to do the second drawing. It’s not bad but when I looked at it again, it looked to me like the middle of the open flower was sitting on one of the petals rather than in the middle which put me right off. Neither of these pics will make it to my gallery. Hey Ho! 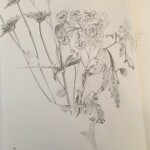 We were away again at the weekend so I didn’t spend as much time as I wanted to or should on drawing this week and I’m very late posting this blog but as I sit here today, I’m just about to get my pencils out and get drawing. I’m a bit late uploading a picture and blog for this week. 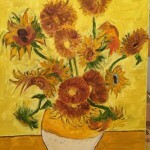 I had a couple of challenges with picture sizes and the hosting space on my site, which I’m hopeful I’ve now resolved so I should be back to my normal weekly blog recording the progress on my art course. Phew! So, this week I was working on my second assignment. The still life from last week and the pen and ink drawing here make up the two submissions which I will be sending into my tutor later today. 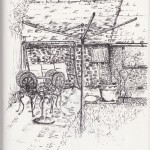 The assignment was to do a pen and ink drawing of a garden, a back yard or a park of some kind. As it’s early February and we’re battling lots of winds and storms here over the last couple of weeks, I didn’t too much fancy spending lots of time out of doors. I did give it a go and walk out to our local war burial site but it was so cold, with no where to sit and my sketch book being blown around it wasn’t too much fun. So, I ended up back in the warm drawing the view from my living room window. It’s not too inspiring at this time of year, the garden is pretty devoid of colour but the shapes and relative perspective of one thing in front of the other was pretty challenging. I’m reasonably happy with the result but it’s not a picture I’d put on my wall. Still, that’s not really the point at the moment. I’m now about to move onto the next module which is on plants and flowers. I quite like drawing flowers so I’m looking forward to this week’s work. Let’s see how I get on.